The Olympique Lyonnais, nicknamed « OL » or « Les Gones » by every enthusiast, is the football team that became institution and now rules the everyday life of most people from Lyon. A plethora of championships and trophies has established the Olympique Lyonnais as one of the best football clubs in France and Europe, and definitely the most important sports club in Lyon. The men’s and women’s teams have trusted the top of their tables for decades and have both conquered trophies to turn Lyon into one of the most decorated clubs in French history. The Olympique Lyonnais was founded on August 3rd, 1950 and registered as the Olympique de Lyon et du Rhône, an informal name still in place today that was suggested by the renowned Lyonnais surgeon, Albert Trillat. The first part of the club’s history was anchored in inconsistency, between the first moments of glory (3 French Cups in the 1960s and 1970s) and the fall to the second division in the 1980s. The arrival of Jean-Michel Aulas, local and outstanding businessman, to the presidency in 1987 launched the club forward as he looked to build Lyon’s framework and settle in the elite division. The Olympique Lyonnais reached its pinacle between 2002 and 2008, with a record-breaking stretch of seven consecutive League 1 titles. Lyon emerged in the meantime as a European stalwart thanks to 12 consecutive participations in the Champions League between 2001 and 2012, reaching the semifinals in 2010 as the club’s best result. This incredible run of sporting success, along with economic growth, engineered the construction of the 60.000-seat Groupama Stadium in the suburbs of Lyon, in Décines-Charpieu, where the team has been playing since 2016. 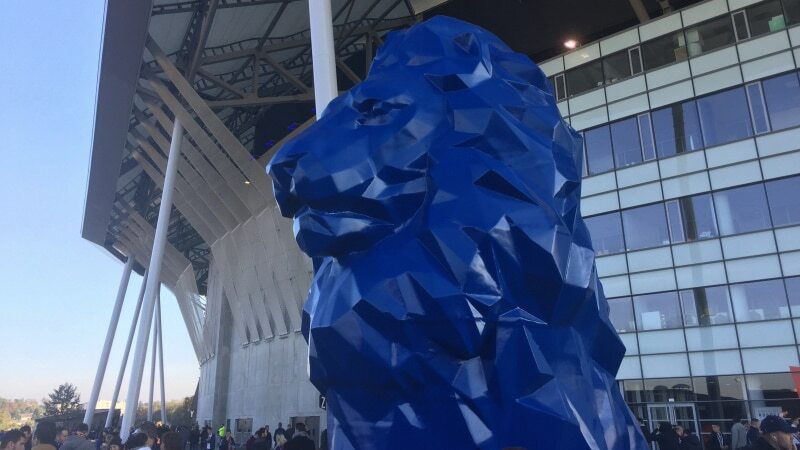 The Olympique Lyonnais owns the exclusive property of the stadium, a unique feat for professional teams in France that replicates what the best European football clubs have done. Separated by only 62 kilometers, Lyon and St-Etienne hold a strong and passionate rivalry culminating each year with two clashes. The « derby » maintains heated relationships between players on the football pitch and supporters of both teams, after 116 matchups between « Les Gones » et « Les Verts ». Provocative press statements, tifos and gestures play an entire part of the rivalry for decades, on both sides. 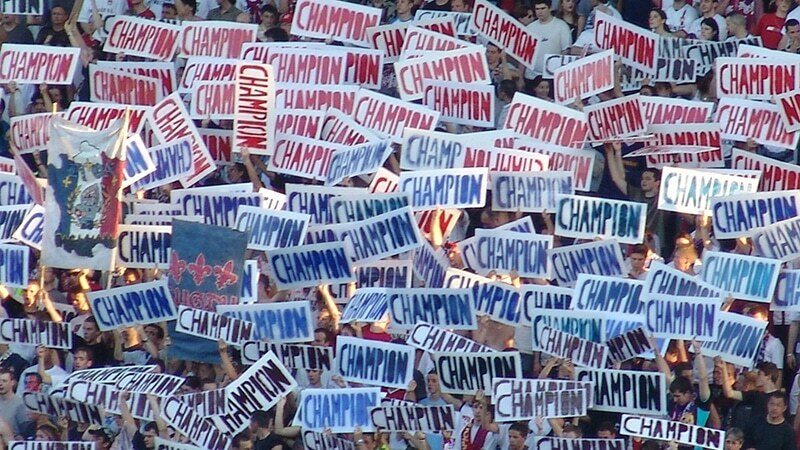 The “Kop Virage Nord” usually celebrates the Olympique Lyonnais success with banners. St-Etienne’s president in the 1970s, Roger Rocher, stated that « in terms of football, Lyon has always been the suburbs of St-Etienne », when his team was dominating French football. Years later, in 2014, Lyon’s goalkeeper coach Joël Bats hung up an Olympique Lyonnais scarf at the rival’s net, bringing the fury out of the rival’s crowd. The Olympique Lyonnais also holds the most successful women’s team in Europe since 2004, date of the team’s creation. 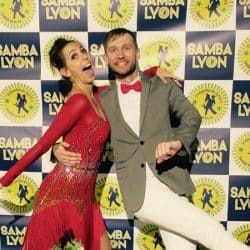 Thanks to first-class facilites on par with the men’s team, it has won 11 consecutive French national championships from 2007 to 2017 and was crowned as the best European team four times since 2011, bringing the Champions League home in 2011, 2012, 2016 and 2017. 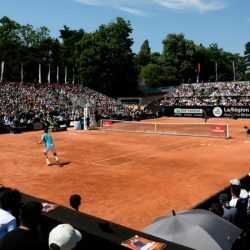 Major international athletes came to play for Lyon, but there is nothing compared to the connection with the best American players. Hope Solo in 2005, Megan Rapinoe in 2013-14, Alex Morgan in 2017 and Morgan Brian in 2018 all played under the Olympique Lyonnais shirt. Successful businessman from Lyon in the computing field, Jean-Michel Aulas is introduced to the football world when he takes over the Olympique Lyonnais in 1987. While the club was on the verge of economic disaster at the bottom of the second division, Jean-Michel Aulas presented an ambitious plan : bring the club back into the first division and to the European level within four years. He eventually turned Lyon into one of the most influential and richest clubs in Europe. Jean-Michel Aulas building of the Olympique Lyonnais culminates with the Groupama Stadium (picture). However, Jean-Michel Aulas is often criticized for its « football-business » vision or delicate relationship with media outlets. His outspoken, agressive and unconventional style of communicating through Twitter creates controversies on a recurrent basis, when he pitches the Olympique Lyonnais to attract new players or attacks journalists, referees and other club’s presidents. Managed by the « OL Groupe », holding company created and directed by Jean-Michel Aulas, Lyon became the first and only football club in France listed in a stock exchange. The business background of Jean-Michel Aulas helped securing many endorsements and sponsorships to build up the Olympique Lyonnais. Jean-Michel Aulas teamed up in 1999 with the notorious movie theaters chain and communication group, Pathé, in a partnership deal that brought 100 million francs to the club’s treasury. The fund was then used to acquire players that originated Lyon’s championships. Yves Chauveau and Fleury Di Nallo, most known as the « Little Prince of Gerland », carried the club to its first trophies in 1964 and 1967, winning the Coupe de France for a third time in 1973 with Bernard Lacombe and Raymond Domenech, two famous figures of the football in Lyon. The club’s formation center, called OL Academy, perpetuated the local bloodline by becoming one of the most renowned youth groups in Europe. It also produced a myriad of influential players such as Karim Benzema, Alexandre Lacazette or Nabil Fekir, all Lyon natives. A deep Brazilian connection full of iconic players was introduced at the turn of the century. 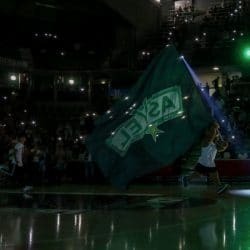 The acquirement of Sonny Anderson in 1999 started off the Brazilian era with a bang, followed by a dozen of fellow countrymen over the next decade to play a role in winning the seven championships. Cris « The Policeman » or Juninho Pernambucano, jewel of the Brazilian generation and best free-kick specialist that ever existed, are names that still resonates in the mind of supporters. 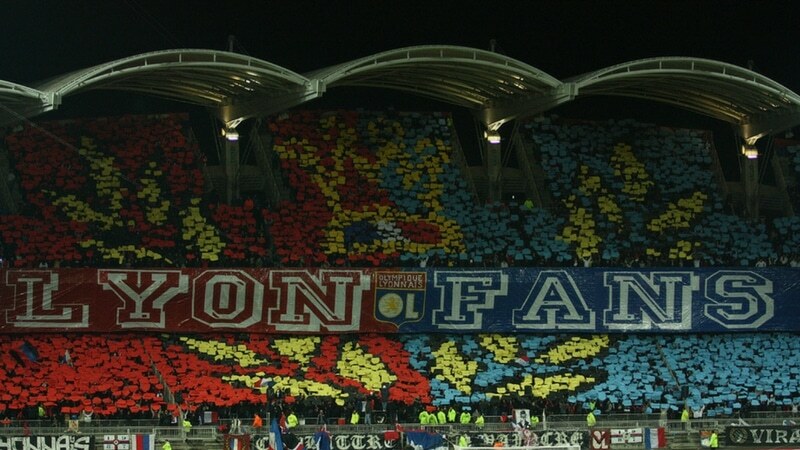 The « Kop Virage Nord » is the biggest supporters’ group of the Olympique Lyonnais created in 2001 by the « Bad Gones », an historical entity in the club’s stands since 1987. 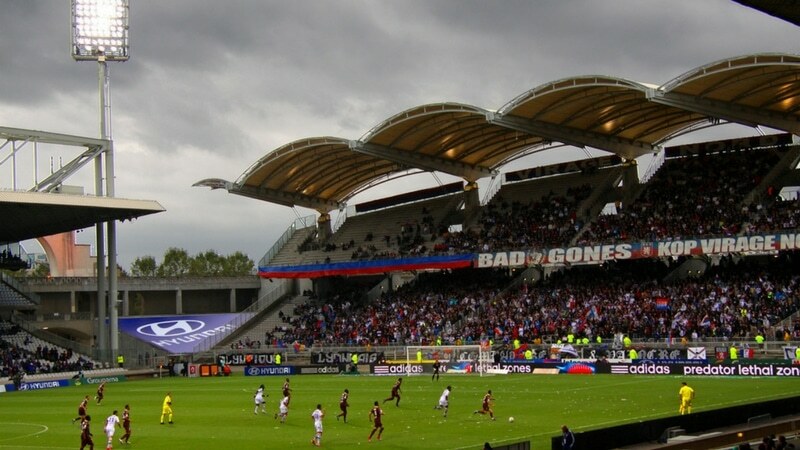 It leads in terms of subscribers and influence the dozen of other supporters’ group along with « Lyon 1950 », standing on the opposite turn of the stadium since 2009. Where to find the Olympique Lyonnais ? The Olympique Lyonnais played for 65 years in Stade de Gerland, located in a sporting complex in the southern tip of Lyon’s 7th arrondissement. The 40.000-seat stadium, constructed by the famous Lyonnais architect Tony Garnier and inaugurated in 1926, was the Olympique Lyonnais home since the club’s inception. On September 9th, 1980, the Stade de Gerland reached its record capacity with an audience of 48 552 fans for the clash against St-Etienne. During the 2015-16 season, Lyon moved in the 60.000-seat Groupama Stadium in Décines-Charpieu, which stands as the third-largest stadium in France in terms of capacity. 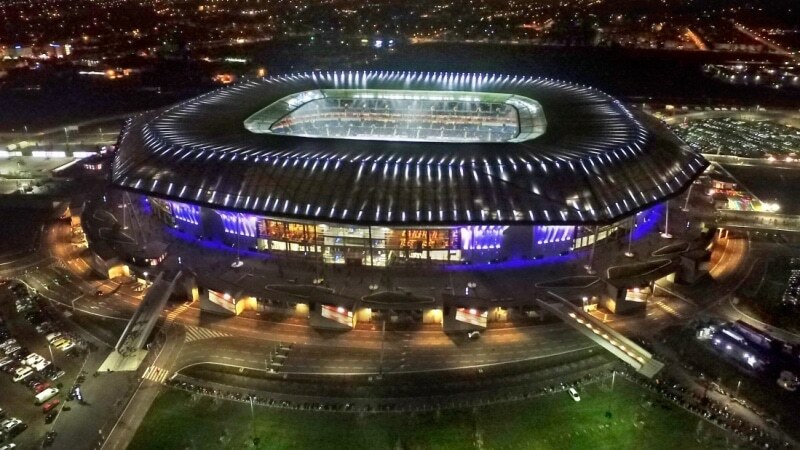 Despite a fierce backlash and opposition from the nearby residents, the move was motivated by the club’s president Jean-Michel Aulas’s wish to leave the city-owned Stade de Gerland and earn more revenue with the Groupama Stadium. A bird’s eye view of the Groupama Stadium, home of the Olympique Lyonnais, in the suburbs of Lyon. The derby against St-Etienne (once again) drew an record audience of 58 069 on February 25th, 2018. How to contact the Olympique Lyonnais ? Stay close to the club’s news on their official website, in English. 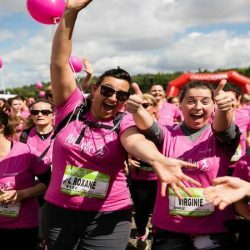 How to get to the Olympique Lyonnais stadium ? 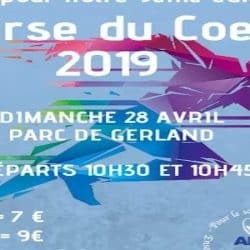 Aimé Mignot, Fleury Di Nallo, Serge Chiesa, Bernard Lacombe, Raymond Domenech, Alain Caveglia, Sonny Anderson, Grégory Coupet, Sidney Govou, Juninho Pernambucano, Cris, Karim Benzema, Hugo Lloris and Alexandre Lacazette.